Sean Conway is an adventurer and extreme endurance athlete. In 2015, Sean took on a huge challenge – The Great British Triathlon, a challenge many considered impossible. The following year, Sean upped the bar and completed a self-supported continuous Ultra Triathlon around the coast of Britain. The challenge was filmed for the Discovery Channel. The British Ultra Triathlon is set around the coast of mainland Britain and is more than 4,000 miles – the equivalent distance of London to New Delhi. This challenge pushed Sean’s limits beyond anything he has done. During the challenge, Sean received an overwhelming level of public support particularly via twitter, with the hashtag #GoSeanGo. Sean Conway is now best known for his quirky take on endurance sports and adventures (and his ginger beard). Sean came to the UK in 2002 with just £100 in his pocket. He started working in Cambridge cutting 12,000 cabbages a day! Later, having made his living as a photographer, Sean sold his business for £1 knowing he had to take a risk and change his life and its purpose. 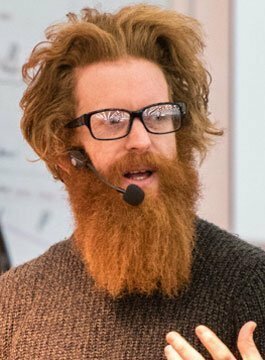 Each presentation is tailored to suit the event’s theme and are built around Sean’s unique perspective on courage, resilience, challenge and a call to action – to ‘Find Your Beard‘. (Beard is an archaic verb meaning to boldly confront or challenge). You will learn how Sean tackled seemingly impossible goals, developed resilience when it got tough, and how he stayed motivated for the long haul despite disappointment, injury and set-backs. Sean’s own story of how he ‘found his beard’ is entertaining and inspirational. Sean has written books about his adventures including Hell and High Water: One Man’s Attempt to Swim the Length of Britain.